Five journals, spiral-bound, sit in my writing studio. Their pages, bowed from cargo storage on flights from Florida to Pennsylvania, contain snatches of conversation from the last nine years of Aunt Ruthie’s life. Since 2008, she has had to cope with a pacemaker implant, pneumonia, a broken hip, and most significantly – memory loss. Through it all, she has shown me how to age with fortitude and grace. Just before her 90th birthday, Aunt Ruthie underwent a pacemaker implant followed by patchy pneumonia. After the party, I became her nurse for several weeks. Three days later on August 12 as I left her home for the airport, she remarked: “You have been a wonderful nurse.” My ministrations had been tiring, especially when her dog Fritzie, maybe fearing I would be a fixture in the house competing with his mistress, sank a fang deep into my thumb flesh. Blood spurted out, I screamed, but the deed was done. I carried the black and blue thumbnail scar for over a year. 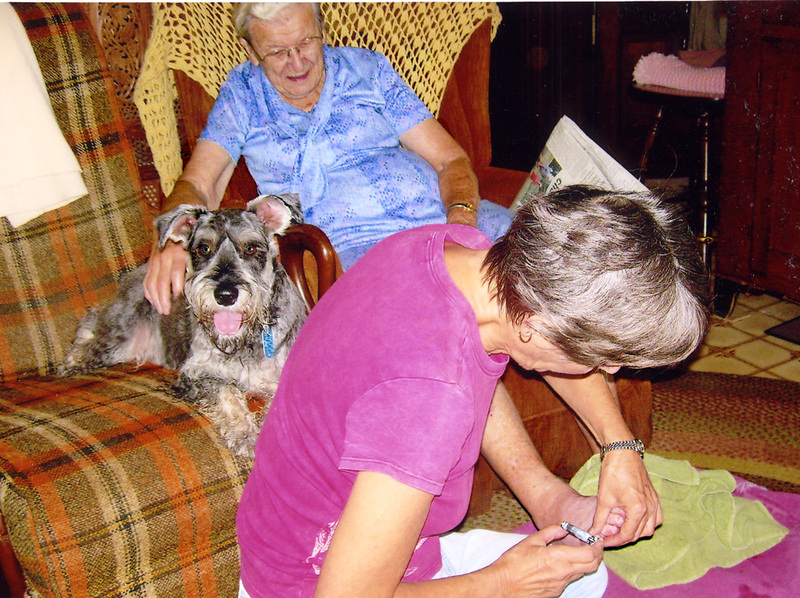 January 2010 – “I’m learning a new life.” As her hip heals, I stitch back the arm on Fritzie’s teddy bear toy. Wishing she could work in the garden that has now been turned to grass. Asking me to take her to Weaver Fabric shop for hairpins to use with her prayer covering. She registers disappointment with a “Boo Hoo” – I can’t mow my lawn anymore! February 2017 Without hesitation, she can read all the words on this placard. We are thrilled she can remember all of our names, “Marian, Janice, and Jean,” she recites with a smile. Later, to an aide: “You can take my blood pressure, but don’t take it with you.” – ha-ha! January 2010 – Before surgery to repair broken hip, she inquired about burial plots” “If there is not enough space for a casket, I’ll volunteer to be cremated,” she remarked in pre-op. Actually, there is a tombstone with her name and birthdate waiting for her in Bossler Mennonite cemetery since 1946, when her father died. Earlier on the gurney, she had inquired about suffering Haitians she had heard about in the news. My observation January 2012: The best qualifications for taking care of someone with memory loss: be kind, have a low IQ, and not be related to the patient. From your observation or experience, what do you think about care-taking those with memory loss? Other observations? Day or night, the light is always on here. Thank you for joining the conversation. Oh my, have you hit close to home with this one. On my mother’s side, I’ve got a string of long-livers: 104, and a few in their 80s. None suffered from memory loss. But here at home, I live with it daily. It’s not so much memory loss, as you have described it. It’s more that the new stuff can’t get in. So if we have a conversation and make a decision, but then sometime later decide on a different path, that change will NOT register. It is a new normal. Not sure of a solution for the condition you experience at home. Write it down? Record it? We take our minds/memories for granted until something mis-fires or fails to fire at all. Accepting it as a new normal is probably the best course for now. Thanks, Janet. Good morning (again), Marian. I love your Aunt Ruthie’s sense of humor, even when feeling down about not being able to do things she once did. Her comments here made me chuckle. My mother has become more forgetful, but so far, it’s not enough to serious affect her. What’s harder for her is that she can hardly see. It’s cut down on her interaction with people, and she really misses reading. As a result, I think she doesn’t get much mental stimulation. Audio books may be a good solution for your mother if she still has good hearing. I notice she appears in most of your family photos. Just your presence must be some comfort to her. Your Aunt Ruthie’s journals are similar to my own grandmother’s writings. She kept small 5×7 spiral notebooks and scribbled snippets here and there. At times, months passed before the next entry. “This is the hardest part – Being waited on! All my life I helped other people.” My 90 year-old aunt said the same thing to me recently. I would imagine that’s very hard. I’m just entering the season of care-taking, so I’ll have to get back with you on that question, Marian. 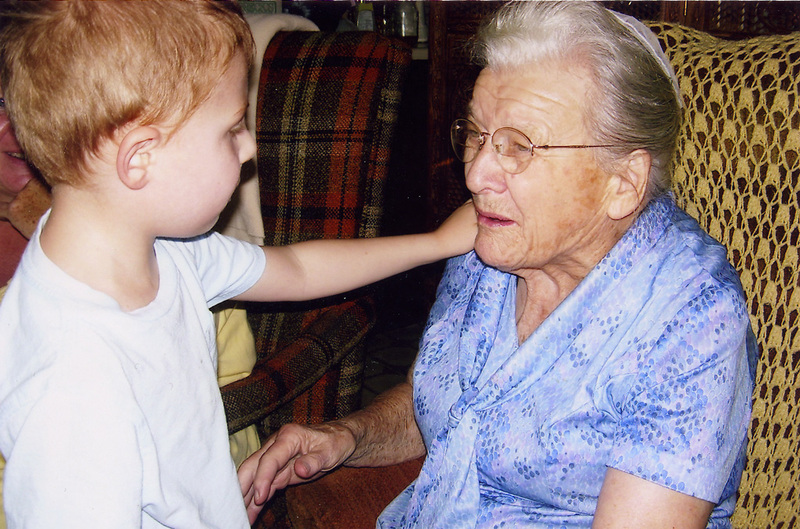 Because of longevity, so many of us are experiencing care-taking of elderly relatives. My aunt was able to stay in her own home for many years, thanks to the willingness of my brother Mark. Though she is no longer in her own home, we take comfort in the fact she is well cared for and visit her as often as possible. On another note, I am so excited about your book publication this week. I just ordered a copy for my Kindle! I’m beginning to feel like your Aunt Ruthie is my aunt! Thank you for sharing this touching story. I think care-taking those with memory loss requires humility, the kind of patience possible only by the grace of God, an oversized sense of humor, think-outside-the-box creativity, and a network of family and friends who care for the care-giver. You speak with the authority of experience, Tracy, and what you say rings true. What is often overlooked is “a network of family and friends who care for the care-giver.” God-infused patience helps too! I think you have access to both. I’m with Tracy. If I ever meet your aunt, she will be “Aunt Ruthie” to me also. Safe journey, Aunt Ruthie. And you too, Marian. I did not have Maxine Kumin’s words in mind at all, but they certainly fit here. That’s the beauty of comments – they always enlarge the topic, much like in a good classroom discussion. We are making the journey up the north again soon. Reservations are for March but it may be sooner. Thanks for the good wishes, which make me feel less alone. My father had memory loss and the saddest I ever felt was when I showed him a video, maybe around 2001 or 02, that had been taped of him in the early 1990s telling the stories he used to tell us of his time in Civilian Public Service during WWII. He stared at the screen, listened to himself, and said, “Who is that man?” and truly did not know. He didn’t have Alzheimer’s but he could not put the man on the TV screen together with his own image of himself. Bless you for being in your Aunt’s life for so long. You are wise to plan another trip. Yesterday the woman helping Aunt Ruthie gave her weekly report and mentioned that she came up with some “zingers” recently. Now I’ll have to find out what they were! Thanks for sharing your illustration about your father, Melodie, poignant, heart-breaking. I know from other stories, he lived a productive life though. May those precious memories sustain you. And zingers is a great name for the lines we like to collect. Have a good day, Marian! Got it! I remember you referred to your mother’s sayings as “Berthaisms.” As I made the transition from plain to fancy, my more urbane roommates in Charlotte referred to my naive comments as “Marianisms.” I was too embarrassed to write them down, but I’m sure my children would howl at my cluelessness. I’d probably laugh too! Welcome, Judith! Serious illness of any sort affects the entire family. That’s self-care for the care-giver is so important. My journals 📓 have become a memory aid for us all. Most of the time I was totally exhausted when I pulled out my notebook. So happy I did though! My condolences to you on the loss of your good friend. Thank you so much for stopping by here today. Do visit again! What a wonderful post of Aunt Ruthie. My last visit with her was with Mom and Mark. I walked in first I said aunt Ruthie do you remember me. She said kind of but I know those two characters behind you. She has such a great sense of humor. Mom said that aunt Ruthie told her that they both had the same name why don’t you stay here and I’ll leave with Mark. We laughed so much of some the things she would say. She loves her fritzie. She said that fritzie was rambunctious and would bark at anyone that came to the door. She asked about fritzie in between conversation and I’d would repeat what she oh she good rambunctious as ever barks at anyone who comes to the door she’d laugh and agree. You are so blessed to have had a great family treasures and memories. I praise God for loving me enough to part take life in this family. We are happy that you share in the many family memories and know most of the characters in my early life. Thanks for all of the reminders here, Gloria. What an amazing lady. I’ve often thought memory loss is harder on those around than ther person suffering it. Mostly they don’t remember they don’t remember. You are absolutely right. As you say, “Mostly they don’t remember they don’t remember.” Only when she was in the transitional stage between fully functional and unaware did she feel in most distress, my guess. The most heart-rending words I ever heard her say, “I feel my mind is going in reverse and I don’t now how to stop it. Thanks for weighing in here again, Marie. Marian, bless you for keeping these journals! Sadly I’ve found that, as relatives pass on, I quickly forget the sound of their voice. Next I begin to forget all the wise, funny or poignant things they said and did. These snippets of conversation are a treasure. I hope you’re making some audio recordings as well. Someone made an audio conversation of both my aunt and mother, but I can’t seem to get my hands on them. Even so, I’ll keep trying. A long time ago my husband recorded their voices too on cassette, which will have to transferred to digital format at some point. “The sound of their voice” provides a more immediate access to loved ones’ personality than mere words on paper. Thanks for the suggestion, Lynn. I’m completely charmed by Aunt Ruthie Marian! How wonderful that you’re keeping her remarks. They’ll charm many for a long while yet. Those who care-take elderly relatives with love, compassion and humour have to be the kindest people in the world with hearts of pure gold. It must be dreadfully hard to lose one’s independence, yet warming to know that there are others who care, and to give love in return even if not expressed which Aunt Ruthie can still do – with HER heart of pure gold. Thank you, Susan. My care-taking documented here was sporadic and quite a while ago. Now Aunt Ruthie is cared for ’round the clock with gentle folks. I get a report weekly, and the health aide said she has come up with some zingers this past week. Now I am curious what they were. I am sure they would fit somewhere here under the “humor” column. A beautiful post, Marian. And so is your Aunt Ruthie. Her sense of humor is a gift. I hope I’ll be able to hang on to mine when my mind begins crashing. My mother’s dementia was the angry kind, making helping her very difficult. I am currently working on being at ease and patient with Bill whose memory is beginning to slip. He knows it and is often horrified, but still has a sense of humor. He often says, “Last year I had a knee replacement and a shoulder replacement and now I need a brain replacement.” It is a difficult thing to live with, whether you are the one forgetting or the caretaker. Living together, whether it’s with a husband or other close relative requires so much forbearance. I am learning to be more patient with my husband’s hearing loss as you are with Bill’s memory lapses. You and Bill are a great pair, you with the sharp memory and he with enduring humor. And to think you were able to get your memoir published in the midst of several health detours. Brava, I say! More often than not the Cliff Beaman family, proceeding from northern Florida to southeastern PA, would stay in Aunt Ruthie’s and Grandmother’s house. It was roomy with lots of interesting (ancient and new) things to behold each time we would find a respite from teaching careers during Christmas vacation or sometimes in the summertime. From early on through college Ruthie was the catalyst that would wrap her niece Marian with literature, learning and cultural experiences. Adding the grace and humor of her Grandmother Fanny, and their combined Godly lifestyle with unconditional love toward others challenged Marian to be beautiful butterfly she is today. Keep flying my Dear! Good thing I didn’t mark this comment as spam. As always, thanks for the encouragement! Oh, Darlene, I hope you are taking notes when your mother talks about the 100+ year-old photos. If I had been smart, I would have recorded names of relatives on both sides of the family that I stare at blankly in pictures these days. Skype is a wonderful way to keep in touch, something to look forward to for both you, Darlene. Your mother probably comes up with quotable lines too on and off camera. I imagine people like your mother and my aunt keep life entertaining for staff who care for the elderly, which much of the time may be a dreary job. Your Aunt Ruthie is a miracle of resiliency, humor, and love of life. Dementia is not funny, yet your aunt finds ways of ‘zinging’ in the truth. My mom’s dementia is so deep that she’s lost her smile and her sense of herself, so therefore, her sense of humor is gone. She doesn’t want to be this way, so she doesn’t want to live, and who can blame her? The other day she tried to stop herself from breathing, so that she could die. She was devastated that she was unable to do that. Talk about a heart breaking…. But the love isn’t gone. She feels it, and she still tells me “I LOVE YOU” every day. That makes my heart sing. Oh my gosh, Pamela, you are right, who can blame her? Still, between the heart-break and the agony you suffer there is love. Ruthie knows there is mutual love between us, yet she never has said the words “I love you.” Many Swiss Mennonites of her era were and are stoic like that, embarrassed to express affection with words. Thanks for your insight. May you hear more love notes this week! In and out of my memoir drafts you have become well-acquainted with my aunt, Kathy. 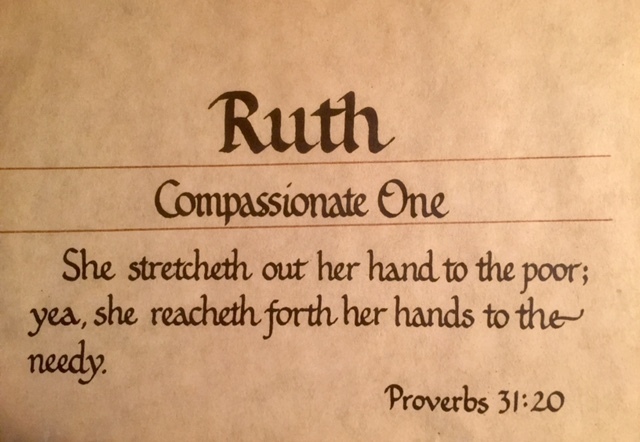 I think that character traits throughout one’s life become accentuated in the elder years; that is certainly true of Ruthie. I’ll pass your comment on to Cliff. Thank you! Those journals are a treasure and will always be there to help you remember, even should a time come when memories become vague. Am living with some of that because of my husband’s stroke. So much to appreciate on the good (clear) days… so much to mourn on the not so good. But we smile and feel grateful for what we have… ! Your husband is fortunate to have you by his side right now regardless of the weather. I can feel both the gratitude and the angst in your voice here. Thank you for joining in the conversation, Mimi. In our days together at the college, we gave our health such little thought. Not so anymore! What an amazing woman – full of kindness and wit! I often notice Ruby and other pets in your scenic photos. Ruthie and you have that in common: She was so devoted to her schnauzer Fritizie, by her side or in her lap until she moved to a facility that no longer permits pets, except for short visits. Thanks for your kind words here, Lady Fi! My Mom and I had a good laugh (and cry) on the weekend, remembering the nurse telling my Mom that someone drove their wheelchair into my grandmother and she called them an idiot! The “driver” didn’t even respond, just kept right on trucking! So I come by it honestly! Did I tell you I prefer chocolate to vanilla ice cream? The same applies to personality, spicy beats bland any day. More power to that grandmother who can elicit such emotions from her close kin. Thanks for popping over today, Jenn. Every day as a care-giver was very intense. I wrote to preserve the events and words spoken. It turns out keeping a record was also a great way to discharge strong emotions at the end of the day and lay them to rest. I’m pleased that you could relate to the narrative here. Thank you, Debby. I’m a little late this week Marian because I keep reading and re- reading the entries in your aunt’s journal and I see a different side to her every time . She was undoubtedly a clever and accomplished lady and so funny with it . It’s so hard to let go of someone we love isn’t it . We should all keep journals because those special moments are so easy to forget …good on you for being a loving niece , she would be very proud of you . I am humbled and pleased that you have so thoroughly examined this post, Cherry. I drew from her journal, little snippets that she wrote in calendar blocks (Small squares for each day on a monthly calendar.) The rest of the post is from a diary I kept either when I took care of her during her illnesses or operation or what I heard from staff at the home where she is now staying. Sweet, sweet, sweet. What a beautiful spunky soul! Of course, I mean you, Marian. And Aunt Ruthie, too. Caregiving is difficult for everyone. I love Aunt Ruthie’s earthy honesty. My dog Willow spends two days a week with Vic’s mom. Willow gets an A+ in giving emotional support to people with memory loss and now I know why: Kind, low IQ, and not related to the patient. Thank you, Elaine. Aunt Ruthie can not abide falderal and neither can I. With a pacemaker implant, pneumonia, a broken hip, and memory loss, she’s been through the wringer. Clearly, your Aunt Ruthie is an amazing woman! 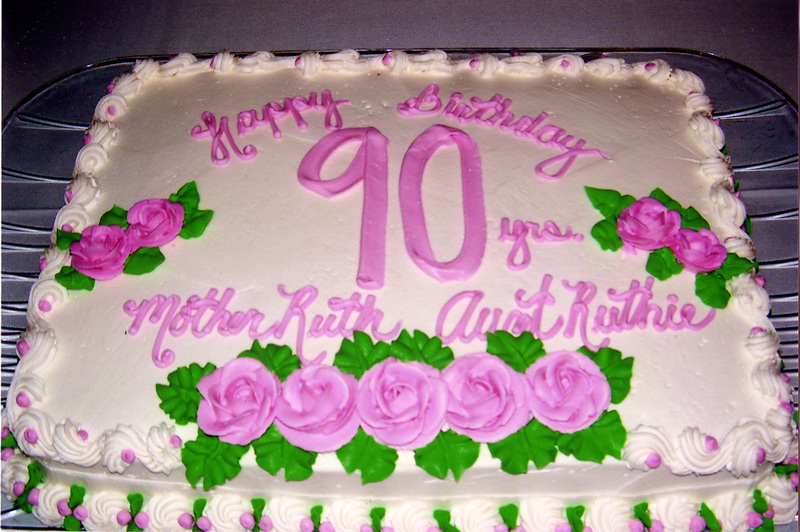 Aunt Ruthie has had 8 more birthdays since her 90th, and yes, she is an amazing woman. She has spoken many of her wise words and humorous zingers since the onset of memory loss. The subconscious mind at work, I must conclude. Thank you for reading, commenting and sharing this post. Just one more month, and we’ll know where you’ve been hiding out. I know it’s not Florida! Thanks for sharing your memories of Aunt Ruthie; she reminds me of my grandma! Why then you have a wonderful legacy too! I sense that as you record family memories through Sage.